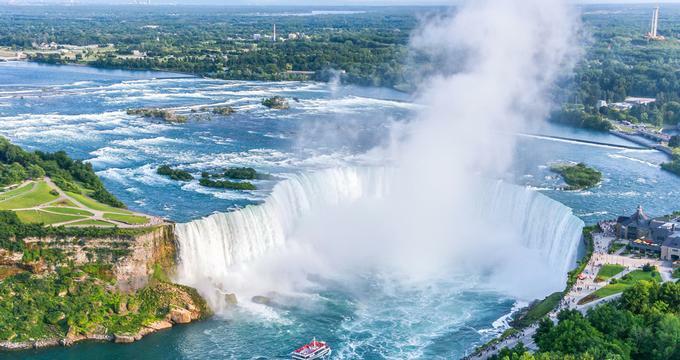 If you've decided to plan a romantic getaway, honeymoon or anniversary trip to Niagara Falls after reading Best Things to See & Do, there are many great options for couples. Couples can stay in a charming inn, cozy bed and breakfast, or a room with a view of the famous waterfalls. Guests looking for an “up close and personal” experience with the Niagara Falls need look no further than the Sheraton on the Falls. With 669 spacious guestrooms and suites, over half of which offer views of the Falls, the hotel provides its visitors with the perfect location to enjoy the sites. Each room features Sheraton’s signature “Sweet Sleeper Beds” along with numerous other high-end amenities. Additionally, the Niagara Falls Sheraton is the anchor of the Falls Avenue Resort, which includes twenty acres of indoor connections to attractions, restaurants, Casino Niagara, and the largest indoor waterpark in North America. 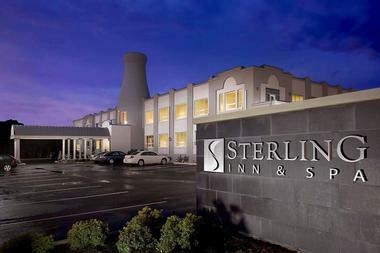 It is hard to imagine that The Sterling Inn and Spa, a strikingly modern boutique hotel a short walk from Victoria Park, was built in 1928 as a milk barn and an ice cream factory. The only reminder is a giant concrete bottle at the entrance, a quirky aspect of the décor of this sleek contemporary space. Spacious, luxurious rooms have private bathrooms with steam showers or whirlpool tubs, Wi-Fi, cable TVs, fridges, fireplaces, and wet bars. Some rooms also have pull-out sofas, and suites have spacious living rooms. Guests enjoy full continental breakfast in the privacy of their rooms. There is also a gourmet restaurant on site, a high-end bar, and a full service spa. 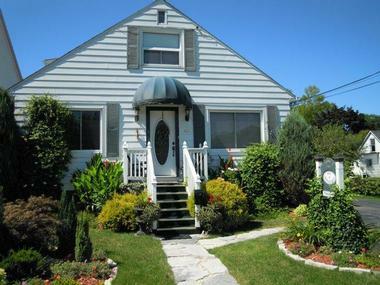 Located on a beautiful residential street only a short drive from the Niagara’s Front Street, Graystone Bed and Breakfast is relaxed, cozy and homey refuge, with three comfortable, well-appointed rooms. All rooms have classic décor, private bathrooms, satellite TVs, and free Wi-Fi. 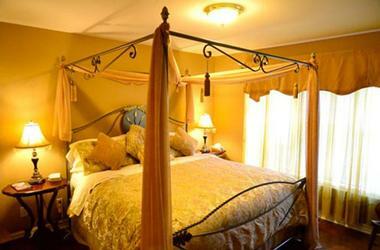 Some rooms also have four-poster beds, fridges, a sofa, a whirlpool tub, or a cozy patio overlooking the orchard. Guests can enjoy a homemade breakfast in the nicely decorated dining room and can curl up with a book in plush armchairs by the fireplace in the lounge room. 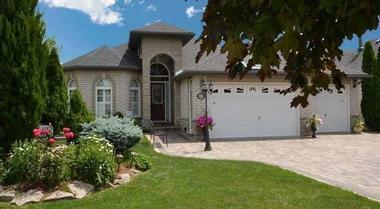 When weather permits, guests can spend time in the beautifully landscaped garden in the back. Operating as a hotel for over 150 years, The Prince of Wales was so named in 1901 to honor the visit of the Duke and Duchess of York. The entire hotel was restored and rehabilitated in 1999. Today the Prince of Wales invites guests to “cocoon” themselves in its award winning luxury. Decorated with a sense of class and elegance, each room includes unique furnishings, Gilchrist & Soames’ Spa Therapy Line bath amenities, luxurious mattresses, ergonomic chairs, and Victorian style solid wood desks. For dining options, guests can choose from Escabèche for fine dining or the cozy Churchill Lounge. Steeped in a long tradition of hospitality, The Oban Resort and Spa has been delighting guests since 1824. In its present iteration, The Oban is a Four Diamond boutique hotel offering guests the choice of one of seven types of rooms. 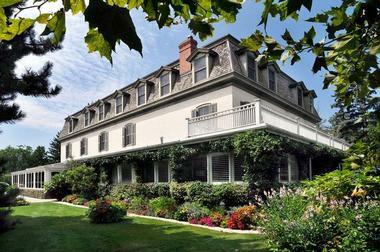 Located in the heart of Wine Country in the Old Town of Niagara-on-the-Lake and overlooking Lake Ontario, the hotel provides its guests with privacy, an outdoor hot spring and swimming pool, access to the world class OSpa, and culinary excellence. Breakfast includes a variety of fresh fruit, juices, coffee, tea, yogurt, and a variety of hot entrees. The Pillar and Post Inn is a 122 room “country inn” that was originally built in the 1890s as a canning factory for peaches and tomatoes. It has been in operation as an inn since 1972. Each guestroom is luxuriously equipped with king, queen, or two double beds with 2-inch mattress pads, 300 thread count sheets, and hypoallergenic duvets. An award winning feature of the hotel, the 100 Fountains Spa, is a 13,000 indoor and outdoor spa space offering a variety of traditional and signature spa services. The dining options available at the Pillar and Post include The Cannery, Vintages Wine Bar and Lounge, and poolside patio dining. The Grand Victorian in Niagara-on-the Lake is an 1860’s Queen Anne Revival style home that today offers guests five luxury rooms and one suite from which to choose. Boasting five large “principal rooms” with 12-foot ceilings, stained glass windows, and an oak fireplace, this inn provides both personal comfort and lovely spaces in which to enjoy the company of other guests, play some of the classic games provided, or listen to any of the selections from the innkeeper’s extensive record collection. 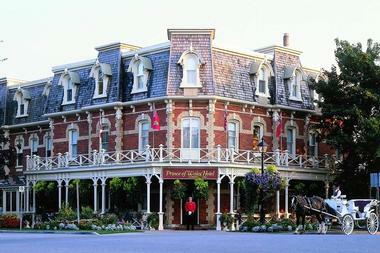 The inn is quite close to the main strip of shops and restaurants in Niagara-on-the Lake and right next to the Reif Estates winery. 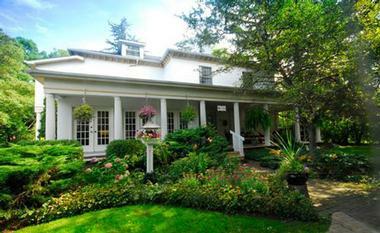 If you are stopping in Niagara-on-the-Lake on your way to explore the world, you will feel right at home in Explorer House, a modern, beautifully decorated bed and breakfast located less than two kilometers from the Niagara River, in a forested neighborhood surrounded by a meticulously tended garden. Each of the three luxuriously appointed suites has a different vibe and décor from a different continent – Asia, Africa, and South America. They have four-poster or sleigh beds, whirlpool tubs, cozy sitting areas, gas fireplaces, and private access to the balcony overlooking the garden. Guests are served a three-course gourmet breakfast in a lovely dining room filled with light. There is also a lounge with a coffeemaker, fridge, and board games for a bit of socializing. The spacious patio is surrounded by the charming garden, which has a romantic gazebo with comfortable chairs and a table for an afternoon coffee or cocktails. 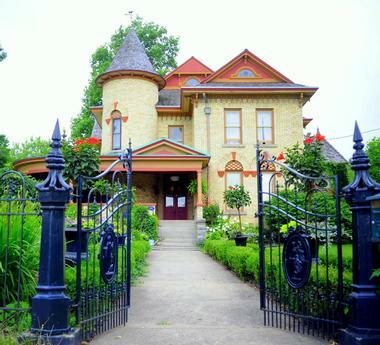 Williams Gate Bed and Breakfast is a charming inn on a quiet residential street just a short walk from the historic Butler’s Barracks and the scenic banks of the Niagara River. The quaint clapboard house has two spacious suites with one or two bedrooms, each with a private entrance, large ensuite bathrooms, TVs, free Wi-Fi, romantic fireplaces, and a cozy sitting area. Guests are served a multi-course gourmet hot breakfast in the homey breakfast room. The lovely garden with seating and a whimsical gazebo are perfect for a quiet moment with a book or for a drink with friends. Built in 1784 for George Ball, one of the first original settlers of Upper Canada, Locust Grove survived three fires, many rebuilds, and various reincarnations. Located in the historical district close to Two Mile Creek Conservation Area, Butler's Barracks, Niagara Historical Society and Museum, and Silversmith Brewing Company, this spectacular, meticulously restored and rebuilt mansion has been returned to its former glory by the current owner. Filled with period pieces and original details, Locust Grove has three beautiful, luxurious suites with fireplaces, private bathrooms, balconies, and free Wi-Fi. Guests enjoy room service, a hot breakfast, and a lovely surrounding garden. La Toscana di Carlotta at Burns House is one of the oldest homes in Niagara-on-the Lake with history dating back as far as 1793. Today the building houses a 3-bedroom bed and breakfast that combines the grand history of the home with Italian flair. Each of the three rooms on offer is outfitted with Italian linens and modern bathrooms. The inn is located a block from King & Queen Streets and is conveniently located for guests who want to get around on foot. The highlight of any stay at this inn is breakfast, where guests are treated to a five-course Italian breakfast featuring espresso, cappuccino, fresh-squeezed juices, fruit, crostini, egg dishes, and dessert. Park Place is a stunning 1800 Victorian building designed in the Queen Anne Revival style that has been beautifully restored and registered as a Canadian historical landmark. Only a short drive to the falls, Casino Niagara, and Skylon Tower, this luxury bed and breakfast is just sufficiently removed from the crowds around the fall park to provide a peaceful retreat. Two magnificent suites are beautifully furnished and oversized, and they feature all modern amenities. One suite has a romantic fireplace while another has a four-poster bed and whirlpool tub. 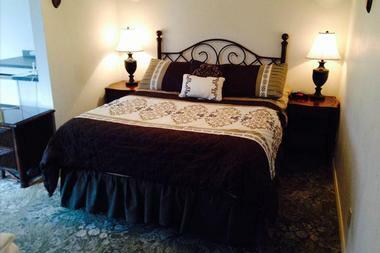 In addition to the suites, there is a renovated carriage house that provides more privacy as well as a cable TV. Guests can enjoy home-cooked hot breakfast in the opulent Oak Room, on the lovely wrap-around porch, or on the patio in the garden. 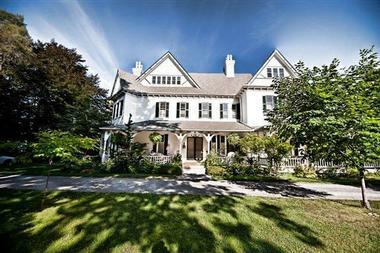 Brockamour Manor, a Georgian Revival home situated in Old Towne Niagara-on-the Lake, offers its guests six rooms from which to choose. All six bedroom suites have private ensuite baths, fireplaces, complimentary bottled water, personal robes, candles, bath salts, and LCD flat screen TVs. Breakfast is a 4-course gourmet meal served in the dining room. Guests are invited to enjoy spacious common rooms where they can read or enjoy a warm fire. The historic grounds are perfect for strolling through gardens, relaxing on the verandah, or simply enjoying the tranquil sound of cascading water. 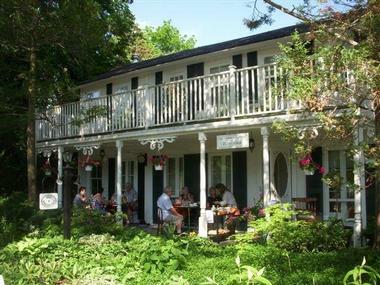 Brockamour Manor is ideally located close to the theatres, restaurants, quaint shops, and wineries of Niagara-on-the Lake. The Queen's Landing has 140 guestrooms decorated in contemporary boutique chic style. Built in 1990, the establishment boasts architecture that reflects the Georgian Era, and the interior is adorned with marble flooring, a sweeping staircase, murals, and a stained glass ceiling. All guestrooms are outfitted in a neutral décor and boast plush hypoallergenic duvets, 2-inch mattress pads, and 300-thread-count sheets. Also featured are in-room safes and high-speed wireless Internet access. Nightly turn-down service includes a long-stemmed rose to adorn guests’ bed. Tiara Restaurant, along with Bacchus Lounge and the outdoor patio, provide a panoramic view of the Niagara River. 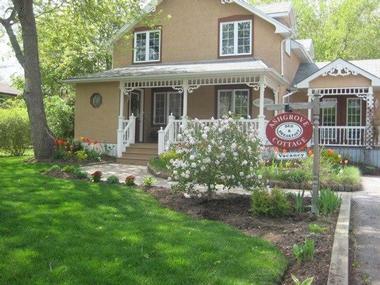 Located just a short walk from the Lake Ontario shores and the town center with all of the restaurants and shops, Ashgrove Cottage is a charming Victorian home covered in flowers and surrounded by a well-tended garden. Three cozy and traditionally decorated rooms are air-conditioned and have private bathrooms, wireless internet, cable TV, DVD player, ceiling fans, and a clock radio. One room also has a fireplace and a soaker tub. Guests are served a homemade hot breakfast with freshly baked goodies. On cold days, guests are invited to relax in the charming small library and sitting room equipped with a hot beverage machine, games, books, and movies. On warm days, a stroll through the beautiful garden or a few quiet moments on a lovely veranda overlooking the flowerbeds are both appealing options. 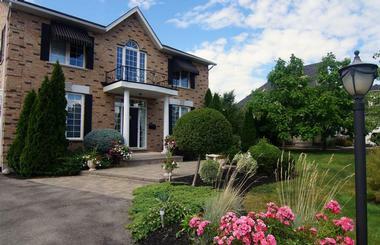 In Elegance Bed and Breakfast is a 3-room inn offering its guests a quiet, intimate place from which to discover the beauties of Niagara-on-the Lake. Each of the three suites are decorated in contemporary European art and have a fireplace with sitting are, and a private ensuite bathroom. Guests are invited to explore the garden patio or relax on the sofa in the reading room. A gourmet breakfast is served daily in the dining room and includes delectable options such as seasonal fruit, juice, baked goods, and main courses like Baked Apple Pancakes, Belgium Waffles, Quiche, and Spinach & Feta Strudel. Antique Slumber Old Town bed and breakfast is a 130-year-old meticulously renovated home located a couple of blocks from Queen Street and Shaw Festival Theatre, just enough to offer privacy and quiet, but close enough for all the action. Three spacious suites are beautifully decorated with family heirlooms and period antiques. They have private bathrooms, whirlpool tubs, and TVs. Two suites have high vaulted ceilings and romantic fireplaces. Guests can enjoy a true gourmet homemade breakfast with fresh baked goodies in the charming dining room. Park benches are set throughout the lush flower garden, and the living room with a fireplace is perfect for socializing on more frosty days. 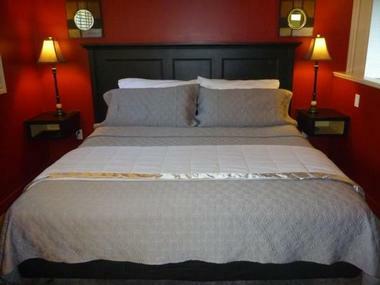 Visitors to the Post House Inn will enjoy much about this 5-room inn, including its convenient location just a block from Main Street and all the shops and restaurants of Niagara-on-the Lake. Guests are close enough to enjoy all the activity, yet far enough away from the hustle and bustle to enjoy the relaxing quiet. The inn boasts beautifully appointed rooms, a pool area, and facility-wide Wi-Fi. A plentiful breakfast is served daily and includes fresh fruit and yogurt, baked goods such as passionfruit cupcakes with buttercream icing, apple muffins, and herbed biscuits. A hot entrée is also served and may include stuffed French toast, waffles with peach compote, or a variety of quiches. 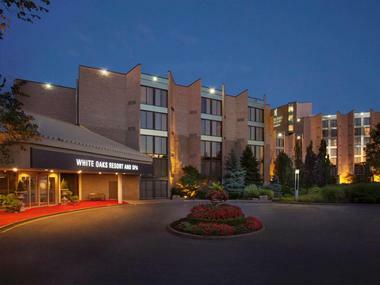 Situated on thirteen acres, The White Oaks Resort and Spa provides a country inn-like experience in the heart of Niagara area attractions. 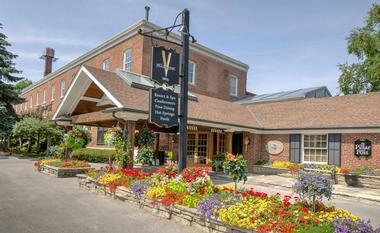 Whether you are visiting the falls or the Niagara-on-the Lake wineries, this hotel delivers luxury 5-star amenities. All 220 rooms are outfitted with pillow top mattresses covered with goose down duvets and pillows, 200 thread count bedding linens, and LG 37 Inch LCD HDTVs. Twenty-six rooms also have fireplaces and deep soaking tubs. The Resort features spa services at The Spa, a fitness center, and two world-class restaurants, the LIV Restaurant and Play Urban Café. 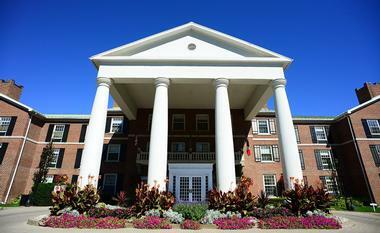 Bruce Manor takes its name from the 561-mile-long Bruce Trail on which it sits. This setting ensures tranquility and peace at this 3-room bed and breakfast in a Georgian style home. All three rooms are grand suites, and each has its own sitting area, bar fridge, ensuite bath, and balcony. Two of the rooms have private entrances, allowing guests unrestricted access to the scenic gardens, Bruce Trail, or the solar heated pool. A hearty breakfast with fresh juices, fruit, sweet or savory entrees, freshly baked goods, and gourmet coffee or tea is served seasonally in the formal dining room or by the pool. 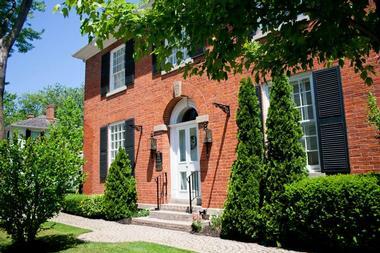 Kellar House, with only two private suites, is an intimately sized bed and breakfast just a 10-minute walk from Downtown Queen Street’s upscale boutiques and fine restaurants. Both rooms come equipped with a king sized bed, a jetted tub, and a fireplace, as well as full ensuite bathrooms. A hot breakfast is provided in the guests’ rooms. The Keller House also has an outdoor deck for lounging. 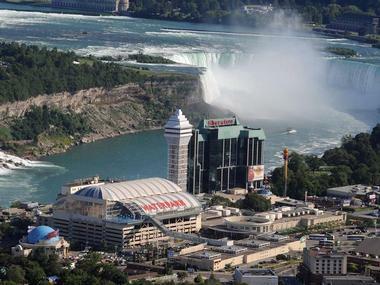 Regionally, guests are only 30 minutes from Niagara Falls. Locally, there are world famous hiking and biking trails as well as a wide variety of vineyards and wineries. 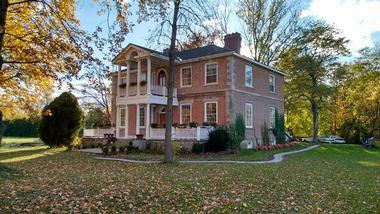 The Eagle's Wing Bed and Breakfast is a 3-bedroom B&B in Niagara-on-the Lake. 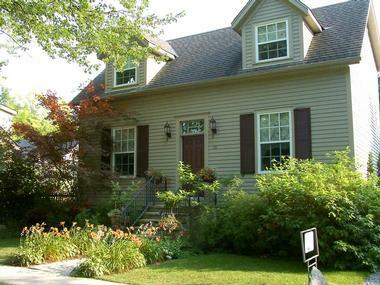 Situated in a Colonial style home, the inn is decorated with a pleasant mixture of period antiques and modern comfort. Guests are encouraged to enjoy not only the indoor décor but also the beautiful gardens and grounds. A deck and gazebo provide superb retreats for bird watching and admiring flowers. Each room has its own modern and private bathroom, and there is a guest lounge stocked with books, magazines, and games for guests’ enjoyment. TVs are also available in the lounge. A varying breakfast freshly prepared from local produce is served each morning in the dining room. 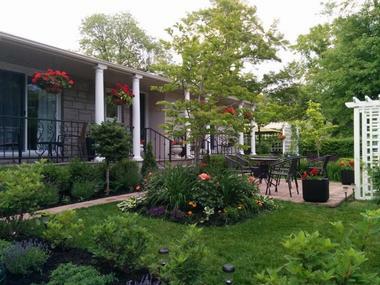 Via Veneto is a lovely Italian-inspired bed and breakfast located in the old part of Niagara-on-the Lake, a short distance from the historic Butler's Barracks and the Shaw Festival Theatre. Three elegant suites have private entrances and are decorated with elegant details from different parts of Italy (Verona, Florence and Sorrento), with warm colors reminiscent of fragrant fields of Provence or the romantic streets of Verona. All suites have modern, luxurious furnishings, private bathrooms, fine linens, flat-screen TVs, and free Wi-Fi. One room has a four-poster bed and one exits to a romantic private balcony. Via Veneto is famous for the homemade lavish gourmet breakfasts served in an elegant dining room or, when weather cooperates, on a terrace overlooking the lush gardens.